I’m having fun with an internet meme that’s been circulating among tarot bloggers, and that is the 30 Day Tarot Challenge, though I’m blazing through it in 6 days, 5 questions each day. Perhaps that is defeating the original purpose of the meme, which is to ponder thoughtfully on each inquiry. I’ve adjusted that purpose a bit. 6. What was the first spread you learned? The Celtic Cross. For many years, it was the only spread I used. That was the old school way of teaching beginners. Thankfully, tarot tutelage has changed these last few decades and students are now beginning with a more manageable number of cards. 7. What is your favorite card (both in terms of deck’s artwork and divinatory meaning)? 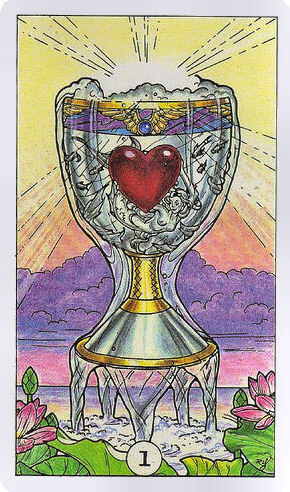 Ace of Cups. Upright, that is. 8. Which card do you dread pulling the most? I’ve reached a point where I don’t dread any of the cards, but that comes with acquiring wrinkles and lines on your face, in other words age. After a while, life simply stops unnerving you. Tragedy and comedy will come as they come. You learn to roll with the punches, as they say. However, when reading for people who are not familiar with tarot, I dread pulling the Death card, because I have to be really artful about explaining the card to them and calming them down. 9. What card do you pull the most often? Why do you think that is the case? Two of Pentacles or Ten of Wands, with seemingly equal frequency. It is the way of our modern world, I suppose. Everyone’s busy. Everyone is overburdened and juggling a bunch of responsibilities at once. 10. What card best represents your personality (or, is most often pulled to represent you in a spread)?